Grant Achatz: The Chef Who Couldn't Taste Two years after opening his award-winning Chicago restaurant Alinea, chef Grant Achatz was diagnosed with tongue cancer. He describes losing and regaining his taste in Life, on the Line. "My palate developed just as a newborn," Achatz says. "I don't recommend it, but I think it made me a better chef." Alinea's version of pheasant, served with shallot, cider gel and burning oak leaves. This interview was originally broadcast on March 3, 2011. 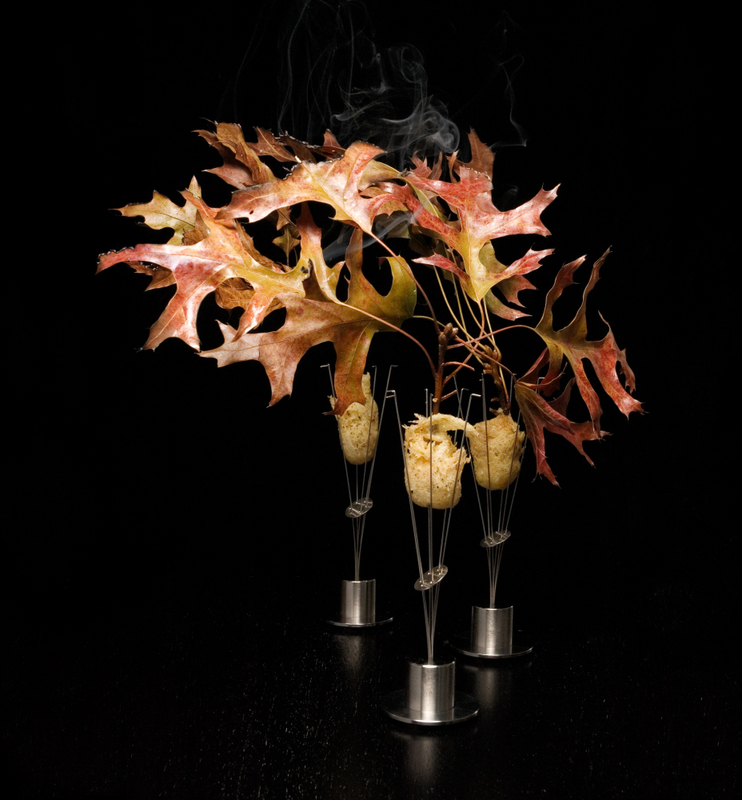 A typical 23-course meal at Chicago's Alinea restaurant might include olive oil lollypops, sweet potatoes skewered by smoking cinnamon sticks, strips of bacon hanging from a stainless steel bow, and pheasant tempura-fried with apple cider, impaled on a flaming oak leaf. Alinea, which opened in 2005, was named the best restaurant in America by Gourmet Magazine in 2006. The restaurant's co-founder and head chef, Grant Achatz, is one of the leading members of the molecular gastronomy movement, which uses unexpected flavor combinations and exotic laboratory tools to create foods based on the molecular compatibility of ingredients. "What makes the food that we do at Alinea so interesting on the outside is that we really don't let ourselves say no to an idea," Achatz says. "When we start looking at things really critically or even very simply, we realize that there's more than one way to actually get the same results ... You're deconstructing the components of a course and putting them back together." Playing with unexpected flavors and scents plays a big part in Achatz's kitchen. Some of Alinea's dishes are served alongside a pillow case with tiny holes in it, designed to release certain fragrances while diners eat. "We've done firewood ashes, we've done leather, we've done grass," says Achatz. "There's a lot of smells that you can't necessarily consume. You're not going to go out and chew on a baseball glove. But, in a lot of ways, a lot of smells that aren't necessarily edible smell good, and they remind you of certain aspects of food. So making those associations with what smells good or smells a certain way and pairing that with actual edible ingredients is one avenue that we take creatively." In 2007, Achatz lost his own ability to taste. He was diagnosed with stage 4 tongue cancer, which metastasized to both sides of his neck. His surgeons told him they were going to cut out his tongue and replace it with muscle from another part of his body. With the surgery, Achatz only had a 50 percent chance of surviving beyond two years. But, he says, he was even more afraid of losing his ability to taste and eat. "I lived my whole life in the kitchen," he says. "Not only that, but it's the passion, it's the love for cooking and food. It's dictated my entire life — every aspect of it. So, in some ways, the thought of not being able to do that anymore radically affects your life." 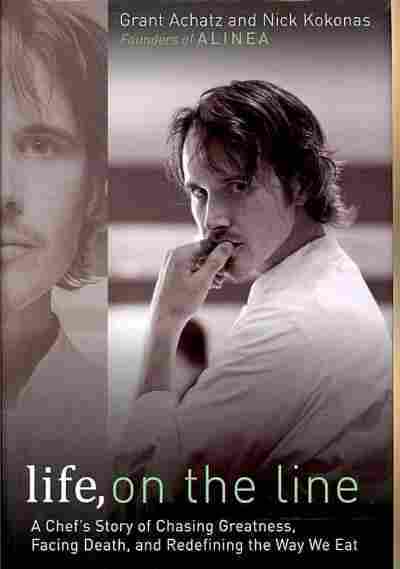 Achatz found a clinical trial at the University of Chicago that agreed to treat him with radiation and chemotherapy. The radiation treatments burned his tongue, shed the lining of his esophagus — and completely destroyed his taste buds. "It was very strange to not be able to discern any flavor at all," he says. "It's funny because, clearly, you know you have to eat to live. But even knowing that, for me, there was no reason to eat. I had no interest in eating whatsoever. I would put something in my mouth — say a vanilla milkshake — and it tasted like nothing." Achatz's cancer is now in remission. After his treatment ended, his ability to taste came back — but slowly. His perception of different flavor combinations — sweet, salty, bitter — came back one flavor at a time. "I started from zero, and the first thing back was sweet," he says. "So my palate developed just as a newborn — but I was 32 years old. So I could understand how flavors were coming back and how they synergized together. ... It was very educational for me. I don't recommend it, but I think it made me a better chef because now I really understand how flavor works." Achatz was named Best Chef in America in 2008 by the James Beard Foundation. He is the author of two books, the memoir Life, on the Line and the coffee table-style cookbook Alinea. He plans to open a new restaurant in Chicago. Called Next, it will completely change its food and style every few months — allowing Achatz to experiment with different ethnic cuisines and periods in time. "Some of the courses served at Alinea are meant to intimidate because, if you think about eating, we do it two, three, four times a day since we're born, basically. And the act of eating — the mechanics of eating — become very monotonous. So literally you're either picking up a fork, a spoon, and you're eating from a plate or bowl with the same motion every time. So if we can break that monotony, then we get you to take notice of the moment, and now you're thinking about the food. It's making you feel a certain way. Then we've won." "Alinea is not the type of restaurant where you go if you're in a hurry. Really, it's about enjoying that three-hour block of time and reflecting on the food, having great conversation with your dining companion. Nobody really needs to eat like that. You need to eat to live. But you certainly don't need to sit down and have a 200-hour, 23-course meal. It's entertainment. It's about having a great time, processing it, thinking about it. We like to think that the food is, in a lot of ways, an intellectual exercise. Sitting through a three-hour meal and having all these feelings — whether they be about the actual food or whatever the occasion is or who you're eating with — [it's] kind of checking yourself out of the pace of life for three hours and enjoying yourself." "It allows us to freeze things that normally don't freeze. For instance, if you take a cup full of olive oil and put it in your freezer at home overnight, you're going to wake up the next morning and it's still going to be liquid because the freezing point of olive oil is very, very low. You take a tablespoon of that olive oil and you put it on top of the anti-griddle, and it will instantly freeze. We've made olive oil lollipops, and it was savory and kind of floods the palate with this smoky paprika and roasted red pepper oil." "If I present to you something that I call 'root beer float,' but it's not in a glass — it's on a plate — it's not liquid — it's solid — and it's not brown — it's completely clear — and I say 'root beer float,' and you look at it and you look at me and you think I'm crazy, I think that's a good thing, because now you're engaged. We're engaging you on so many different levels. And then the payoff is when you put that perfectly clear bite-size cube in your mouth, it tastes like a root beer float."